As I have blogged about previously, our source code is our lifeblood. We continue to rely on the exceptionally stable VisualSVN Server by VisualSVN. While the server itself has always been reliable, installation and upgrades have proven to be rather challenging. This has nothing to do with VisualSVN’s implementation, but rather the complexity of our internal network. In the spirit of saving others time, I am going to review our latest installation experience. But first, a little about our network…. Our VisualSVN Server is located on an externally facing edge server which allows access to our SVN server from both sides of the corporate firewall. The repositories themselves are stored on a NAS file server which is located internal to our network and provides a high level of security and recoverability. From a security standpoint, the repository’s file share is locked down to a dedicated SVN active directory account as well as the customary administrative accounts. The installer promptly rolled back. At least we know the installer works smoothly! After a little bit of digging, it appears the installer is attempting to modify the security settings on the repository files. This failed because we have explicitly disallowed modifications unless you are the SVN domain account or an administrator… the installer was neither! 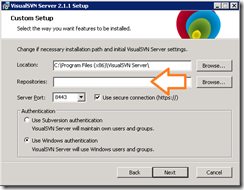 Ignore the network share during installation. This is accomplished by changing the Repositories: path in the custom setup wizard to a local path such as C:TempSVN. See the image below for the field that needs to be changed. That corrected the installer error issue and we are now upgraded to 2.1.1. But, we are not done just yet. There are a couple of more steps we have to complete before the developers can access the updated server. For step #1 above: Open services from administrative tools, right click to show properties for VisualSVN Server, and change the LogOn information to your SVN specific domain account credentials. 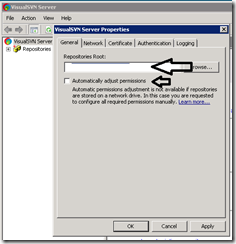 Step #2 requires you to launch the VisualSVN Server Manager and display the server properties. On the General tab, set your Repositories Root to your file share path and uncheck the Automatically adjust permissions check box. See the image below for the fields that need to be changed. 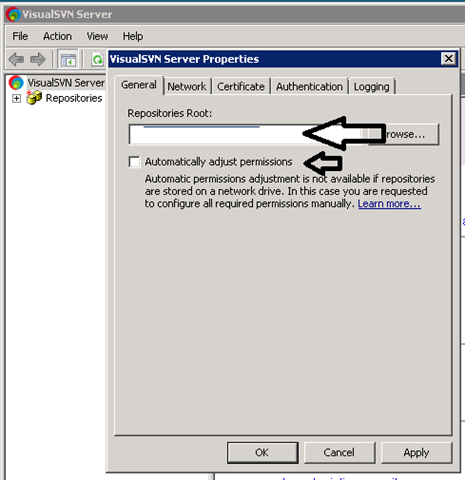 Unable to open C:Program Files (x86)VisualSVN Servercertsserver.pem. The file does not exist or is empty. Line 103 of the httpd.conf file was nothing more than the path to the certificate file certs/server.pem. A quick check of the file proved it not only existed, but it had a valid certificate. Wanna bet we have a security error? We restarted the SVN server and all was well in the world once again. This entry was posted in VisualSVN on February 20, 2010 by ArmgaSys.